OpenOCD uses a command line interface and accepts commands from a telnet client. To compile and use OpenOCD in Windows 7 you will need to enable the &apos;Run&apos; command and telnet client. See Configuring Windows 7 for OpenOCD. If you already have Cygwin installed, this guide recommends that you delete it and reinstall completely. Close all Cygwin windows and services and delete your Cygwin directory (by default, C:\cygwin). Then find any packages downloaded but not installed and delete them as well. You set the location of these files when you installed Cygwin. By default they appear in My Documents/Downloads. If you don&apos;t wish to reinstall Cygwin you can find more information at http://cygwin.com/ml/cygwin/2011-06/msg00021.html. Check all of these packages and click Next. 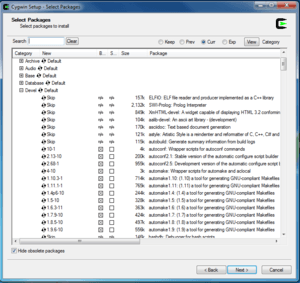 Cygwin will inform you that it must install additional packages to satisfy the above packages&apos; dependencies. Allow it to do so. Make sure that the Select Required Packages checkbox is checked before you proceed. Plug the Flyswatter into your computer&apos;s USB port. The Windows Found New Hardware Wizard will appear twice, once for each interface. Click Cancel both times. With the latest version of Cygwin and its associated packages you may encounter errors with make commands. You may be able to fix these errors simply by powering through; if make gives an error, run make again. If it doesn&apos;t halt again in the same place, you can likely proceed without worry. In another Windows Explorer window, open C:\cygwin\home\openocd\tcl. Click and drag to select all the contents of the folder. Right-click on any file and select Copy. Open C:\openocd-bin, right-click anywhere, and select Paste.